Relationships can often be the true measure of a project’s success. The Minnesota Department of Health’s Healthy Fairs pilot project has certainly experienced success in this way. Healthy Fairs has been evolving since 2011 when the Minnesota Department of Health (MDH) was funded as part of the UMASH Center. Their initial work focused on keeping track of animal agriculture workers and their families who became ill in relation to contact with animal agriculture. 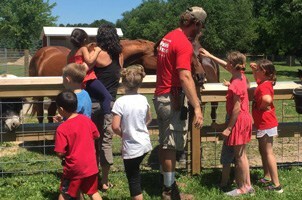 The frequency of outbreaks observed at county fairs and other agritourism spots revealed the need for health and safety education for these venues. To do this, MDH applied for a UMASH pilot grant to create Healthy Fair workshops. They developed and hosted 5 workshops between 2013 and 2016 throughout the state. These workshops were created for county fair board members, FFA, 4H, fair veterinarians, and anyone else involved in planning or running a county fair in Minnesota. Once the Healthy Fairs workshop seemed successful, MDH turned their sights to educating those involved in agritourism by hosting Agritourism Workshops. Both workshops take a One Health approach and are co-hosted by MDH, the Board of Animal Health, the Environmental Health Division at MDH, and the Minnesota Department of Agriculture. The result is a workshop curriculum focused not only on the health risks posed to humans in these settings, but the risks to other animals and the environment as well. Relationships built during these workshops are key as attendees share their challenges and successes around health and safety at their fair. Carrie Klumb, senior epidemiologist at MDH, considers the relationships built during these workshops as the biggest success of the pilot. She commented that, “Even though epidemiologists in the Zoonotic Unit are not in the business of regulating, those in the county fair and agritourism world may not have realized this and were reluctant to work with us at first.” At the beginning of the first workshop in 2013 there was a skeptical silence among the group. By the end of the day however, the room was filled with energy and chatter as attendees shared their challenges and successes around health and safety at their fair. MDH formed a relationship with the Minnesota Federation of County Fairs (MFCF) and is currently in conversation about ways to continue to offer education on Healthy Fairs in the future. Additionally, MDH will be analyzing survey data collected from fairgoers at the 2016 Minnesota State Fair to better understand the general public’s knowledge of animal agriculture health and safety. Ms. Klumb is interested in how the results might influence future education efforts. Learn more about our other UMASH pilot projects. Visit our Agritourism page to learn more about health and safety resources in this area and watch our new hand-washing video, “Farms, Fairs, and Fun – Be sure to wash your hands.”.